THIS world saw our Lord Jesus for a very little time, but now it seeth him no more. It only saw him with the outward eye and after a carnal sort, so that when the clouds received him and concealed him from bodily vision, this spiritually blind world lost sight of him altogether. Here and there, however, among the crowds of the sightless there were a few chosen men who had received spiritual sight; Christ had been light to them, he had opened their blind eyes, and they had seen him as the world had not seen him. In a high and full sense they could say, "We have seen the Lord," for they had in some degree perceived his Godhead, discerned his mission, and learned his spiritual presence of its object, those persons who had seen Jesus spiritually, saw him after he had gone out of the world unto the Father. We who have the same sight still see him. Read carefully the words of the verse before us: "Yet a little while, and the world seeth me no more; but ye see me." 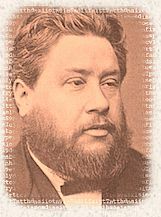 It is a distinguishing mark of a true follower of Jesus that he sees his Lord and Master when he is not to be seen by the bodily eye; he sees him intelligently and spiritually; he knows his Lord, discerns his character, apprehends him by faith, gazes upon him with admiration as our first sight of Christ brought us into spiritual life, for we looked unto him and were saved, so it is by the continuance of this spiritual sight of Christ that our spiritual life is consciously maintained. We lived by looking, we live still by looking. Faith is still the medium by which life comes to us from the life-giving Lord. It is not only upon the first day of the Christian's life that he must needs look to Jesus only, but every day of that life, even until the last, his motto must be, "Looking unto Jesus, the author and finisher of our faith." The world sees him no more, for it never saw him aright; but ye have seen him and lived, and now, through continuing still to see him, you remain in life. Let us ever remember the intimate connection between faith and spiritual life. Faith is the life-look. we must never think that we live by works, by feelings, or by ceremonies. "The just shall live by faith." We dare not preach to the ungodly sinner a way of obtaining life by the works of the law, neither dare we hold up to the most advanced believer a way of sustaining life by legal means. We should in such a case expect to hear the apostle's expostulation, "Are ye so foolish? having begun in the Spirit, are ye now made perfect by the flesh?" Our glorifying is that our life is not dependent on ourselves, but is safe in our Lord, as saith the apostle, "I am crucified with Christ: nevertheless I live; yet not I, but Christ liveth in me: and the life which I now live in the flesh I live by the faith of the Son of God, who loved me, and gave himself for me." Because he lives, we live, and shall live for ever. God grant that our eye may ever be clear towards Jesus, our life. May we have no confidence but in our Redeemer; may our eyes be fixed upon him, that no other object may in any measure or degree shut out our view of him as our all in all. The text contains in it very much of weighty truth, far more than we shall be able to bring forth from it this morning. First, we see in it a life; secondly, that life preserved; and thirdly, the reason for the preservation of that life: "Because I live, ye shall live also." We must not confound this with existence. It were indeed to reduce a very rich text to a poverty-stricken sentence if we read it, "Because I exist, ye shall exist also." We could not say of such a use of words that the water of ordinary speech was turned to wine, but rather that the wine was turned to water. Before the disciples believed in Jesus they existed, and altogether apart from him as their spiritual life their existence would have been continued; it was something far other and higher than immortal existence which our Lord was here dealing with. Life, what is it? We know practically, but we cannot tell in words. We know it, however, to be a mystery of different degrees. As all flesh is not the same flesh, so all life is not the same life. There is the life of the vegetable, the cedar of Lebanon, the hyssop on the wall. There is a considerable advance when we come to animal life—the eagle or the ox. Animal life moves in quite a different world from that in which the plant vegetates—sensation, appetite, instinct, are things to which plants are dead, though they may possess some imitation of them, for one life mimics another. Animal life rises far above the experience and apprehension of the flower of the field. Then there is mental life, which we all of us possess, which introduces us into quite another realm from that which is inhabited by the mere beast. To judge, to foresee, to imagine, to invent, to perform moral acts, are not these new functions which the ox hath not? Now, let it be clear to you, that far above mental life there is another form of life of which the mere carnal man can form no more idea than the plant of the animal, or the animal of the poet. The carnal mind knoweth not spiritual things, because it has no spiritual capacities. As the beast cannot comprehend the pursuits of the philosopher, so the man who is but a natural man cannot comprehend the experience of the spiritually minded. Thus saith the Scripture: "The natural man receiveth not the things of the Spirit of God: for they are foolishness unto him: neither can he know them, because they are spiritually discerned. But he that is spiritual judgeth all things, yet he himself is judged of no man." There is in believers a life which is not to be found in other men—nobler, diviner for education cannot raise the natural man into it, neither can refinement reach it; for at its best, "that which is born of the flesh is flesh," and to all must the humbling truth be spoken, "Ye must be born again." It is to be remarked concerning our life in Christ, that it is the removal of the penalty which fell upon our race for Adam's sin. "In the day that thou eatest thereof thou shalt surely die," was the Lord's threatening to our first parent, who was the representative of the race. He did eat of the fruit, and since God is true, and his word never fails, we may be sure of this, that in that selfsame day Adam died. It is true that he did not cease to exist, but that is quite another thing from dying. The threatening was not that he should ultimately die, but "In the day thou eatest thereof thou shalt surely die;" and it is beyond all doubt that the Lord kept his word to the letter. If the first threatening was not carried out we might take liberty to trifle with all others. Rest assured, then, that the threat was on the spot fulfilled. The spiritual life departed from Adam; he was no longer at one with God, no more able to live and breathe in the same sphere as the Lord. He fell from his first estate; he had need if he should enter into spiritual life to be born again, even as you and I must be. As he hides himself from his Maker, and uttersvain excuses before his God, you see that he is dead to the life of God, dead in trespasses and sins. We also, being heirs of wrath even as others, are through the fall dead, dead in trespasses and sins; and if ever we are to possess spiritual life, it must be said of us, "And you hath he quickened." We must be as "those that are alive from the dead." The world is the valley of dry bones, and grace raises the chosen into newness of life. The fall brought universal death, in the deep spiritual sense of that word, over all mankind; and Jesus delivers us from the consequences of the fall by implanting in us a spiritual life. By no other means can this death be removed: "He that believeth on the Son hath everlasting life: and he that believeth not the Son shall not see life; but the wrath of God abideth on him." The work of regeneration, in which the new life is implanted, effectually restores the ruin of the fall, for we are born again, "not of corruptible seed, but of incorruptible, by the word of God which liveth and abideth for ever." But you remind me that still sin remains in us after we have received the divine life. I know it does, and it is called "the body of this death;" and this it is which rages within, between the power of the death in the first Adam, and the power of the life in the second Adam; but the heavenly life will ultimately overcome the deadly energy of sin. Even to-day our inner life groans after deliverance, but with its groan of "O wretched man that I am! who shall deliver me from the body of this death?" it mingles the thankful song, "I thank God through Jesus Christ our Lord." This life is of a purely spiritual kind. We find analogies and resemblances of it in the common mental life, but they are only analogies, the spiritual life is far and high above the carnal life, and altogether out of sight of the fleshly mind. Scarce are there words in which it can be described. To know this life you must have it; it must pulsate within your own bosom, for no explanations of others can tell you what this life is; it is one of the secrets of the Lord. It would not be possible for us with the greatest skill to communicate to a horse any conception of what imagination is; neither could we by the most diligent use of words, communicate to carnal minds what it is to be joined unto the Lord so as to be one spirit. One thing we know of it, namely, that the spiritual life is intimately connected with the indwelling of the Holy Spirit in the soul. When he comes we are "born again from above," "born of the Spirit." While he works in us mightily our life is active and powerful if he withdraws his active operations our new life becomes faint and sickly. Christ is our life, but he works in us through his Holy Spirit, who dwelleth in us evermore. Further, we know that this life very much consists in union with God. "For to be carnally minded is death; but to be spiritually minded is life and peace. Because the carnal mind is enmity against God: for it is not subject to the law of God, neither again can be. So then they that are in the flesh cannot please God." Death as to the body consists in the body being separated from the soul; the death of the soul lies mainly in the soul's being separated form its God. For the soul to be in union with God is the soul's highest life; in his presence it unfolds itself like an opening flower; away from him it pines, and loses all its beauty and excellence, till it is as a thing destroyed. Let the soul obey God, let it be holy, pure, gracious, then is it happy, an truly living; but a soul sundered from God is a soul blasted, killed, destroyed; it exists in a dreadful death; all its true peace, dignity, and glory, are gone; it is a hideous ruin, the mere corpse of manhood. The new life brings us near to God, makes us think of him, makes us love him, and ultimately makes us like him. My brethren, it is in proportion as you get near to God that you enter into the full enjoyment of life—that life which Jesus Christ gives you, and which Jesus Christ preserves in you. "In his favour is life." Psalm 30:5. "The fear of the Lord is a fountain of life." Prov. 14:27. To turn to God is "repentance unto life." To forget God is for a man to be "dead whilst he liveth." To believe the witness of God is to possess the faith which overcometh the world. "He that believeth on the Son of God hath the witness in himself: he that believeth not God hath made him a liar; because he believeth not the record that God gave of his Son. And this is the record, that God hath given to us eternal life, and this life is in his Son. He that hath the Son hath life; and he that hath not the Son of God hath not life." Thus much concerning this life. We have now to ask each of you whether you have received it. Have you been born, not of blood, nor of the will of the flesh, nor of the will of man, but of God? Was there a time with you when you passed from death unto life, or are you abiding in death? Have you the witness in yourself that you have been operated upon by a divinely spiritual power? Is there something in you which was not once there, not a faculty developed by education, but a life implanted by God himself? Do you feel an inward craving unknown to carnal minds, a longing desire which this world could neither excite nor gratify? Is there a strange sighing for a land as yet unseen, of which it is a native, and for which it yearns? Do you walk among the sons of men as a being of another race, not of the world, even as Christ was not of the world? Can you say, with the favoured apostle, "We know that the Son of God is come, and hath given us an understanding, that we may know him that is true, and we are in him that is true, even in his Son Jesus Christ. This is the true God, and eternal life." Oh! then, thank God for this, and thank God yet more that you have an infallible guarantee for this, and thank God yet more that you have an infallible guarantee that your life shall be continued and perfected, for so saith the text, "Because I live, ye shall live also." II. Our second head treats of LIFE PRESERVED. "Because I live, ye shall live also." There stands the promise, " Ye shall live also. This heavenly life of yours which ye have received shall be preserved to you. Concerning this sentence, let me draw your attention, first of all, to its fullness: "Ye shall live." I think I see in that much more than lies upon the surface. Whatever is meant by living shall be ours. All the degree of life which is secured in the covenant of grace, believers shall have. Moreover, all your new nature shall live, shall thoroughly live, shall eternally live. By this word it is secured that the eternal life implanted at regeneration shall never die out. As our Lord said so shall it be. "Whosoever drinketh of the water that I shall give him shall never thirst; but the water that I shall give him shall be in him a well of water springing up into everlasting life." We may not view this precious word as referring to all the essential spiritual graces which make up the new man? Not even, in part, shall the new man die. "Ye shall live," applies to all the parts of our new-born nature. If there be any believer here who has not lived to the full extent he might have done, let him lay hold upon this promise; and seeing that it secures the preservation of all his new nature, let him have courage to seek a higher degree of health. "I am come," saith Christ, "that ye might have life, and have it more abundantly." There is no reason, Christian, why your love to Jesus should not become flaming, ardent, conquering; for it lives, and ever must live. As to your faith, it also has immortal vitality in it, and even though it be just now weak, and staggering, lift up the hands that hang down and confirm the feeble knees, for your faith shall not die out. Here in your Lord's promise the abiding nature of the vital faculties of your spirit is guaranteed. There is no stint in the fullness of Christian life. Beneath the skies I would labour to attain it, but herein is my joy, that it shall be most surely mine, for this word is faithful and true. As surely as I have this day eternal life by reason of faith in Christ Jesus, so surely shall I reach its fullness when Christ who is my life shall appear. Even here on earth I have the permit to seek for the fullest development of this life; nay I have a precept in this promise bidding me to seek after it. "Ye shall live," means that the new life shall not be destroyed—no, not as to any of its essentials. All the members of the spiritual man shall be safe; we may say of it as of the Lord himself, "Not a bone of him shall be broken." The shield of Christ's own life covers all the faculties of our spiritual nature. We shall not enter into life halt or maimed; but he will present us faultless before the presence of his glory, not having spot or wrinkle, or any such thing, much less nay dead limbs or decayed faculties. It is a grand promise, and covers the spiritual nature as with the wings of God, so that we may apply to it the words of David, in the ninety-first Psalm: "Surely he shall deliver thee from the snare of the fowler, and from the noisome pestilence. He shall cover thee with his feathers, and under his wings shalt thou trust: his truth shall be thy shield and buckler. Thou shalt not be afraid for the terror by night; nor for the arrow that flieth by day; nor for the pestilence that walketh in darkness; nor for the destruction that wasteth at noonday. A thousand shall fall at thy side, and ten thousand at thy right hand; but it shall not come nigh thee." The text secures that the death-penalty of the law shall never fall upon believers. The quickened man shall never fall back into the old death from which he has escaped; He shall not be numbered with the dead, and condemned either in this life or the next. Never shall the spiritually living become dead again in sin. As Jesus being raised form the dead dieth no more, death hath no more dominion over him; even so sin shall not have dominion over us again. Once, through the offense of one, death reigned in us; but now having received abundance of grace and of the gift of righteousness, we shall reign in life by one, Christ Jesus. Rom. 5:17. "For if, when we were enemies, we were reconciled to God by the death of his Son, much more, being reconciled, we shall be saved by his life." Rom. 5:10. We are united to Christ this day by bands of spiritual life which neither things present nor things to come can separate. Our union to Jesus is eternal. It may be assailed; but it shall never be destroyed. The old body of this death may for awhile prevail, and like Herod it may seek the young child's life, but it cannot die. Who shall condemn to death that which is not under the law? Who shall slay that which abides under the shadow of the Almighty? Even as sin reigned unto death, even so must grace reign unto eternal life, by Jesus Christ our Lord. Remark carefully the continuance insisted upon in this verse. Continuance is indeed the main element of this promise—"Ye shall live." It means certainly that during our abode in this body we shall live. We shall not be again reduced to our death-state during our sojourn here. Ten thousand attempts will be made to bring us under dominion to the law of sin and death, but this one word baffles all. Your soul may be so assailed that it shall seem as if you could not keep your hold on Christ, but Christ shall keep his hold on you. The incorruptible seed may be crushed, bruised, buried, but the life within it shall not extinguished, it shall yet arise. "Ye shall live." When ye see all around you ten thousand elements of death, think ye believers, how grand is this word, "Ye shall live." No falling from grace for you, no being cast out of the covenant, no being driven from the Father's house and left to perish. "Ye shall live." Nor is this all, for when the natural death comes, which indeed to us is no longer death, our inner life shall suffer no hurt whatsoever; it will not even be suspended for a moment. It is not a thing which can be touched by death. The shafts of the last enemy can have no more effect upon the spiritual, than a javelin upon a cloud. Even in the very crisis, when the soul is separated from the body, no damage shall be done to the spiritual nature. And in the awful future, when the judgment comes, when the thrones are set, and the multitudes are gathered, and to the right the righteous, and to the left the wicked, let what may of terror and of horror come frothy, the begotten of God shall live. Onward through eternity, whatever may be the changes which yet are to be disclosed, nothing shall affect our God-given life. Like the life of God himself—eternal, and ever-blessed, it shall continue. Should all things else be swept away, the righteous must live on; I mean not merely that they shall exist, but they shall live in all the fullness of that far-reaching, much-comprehending word "life." Bearing the nature of God as far as the creature can participate in it, the begotten from the dead shall prove the sureness of the promise, "Ye shall live." Let me further call to your notice that the fact here stated is univeral, in application to all spiritual life. The promise is, "Ye shall live," that is to say, every child of God shall live. Every one who sees Christ, as the world sees him not, is living and shall live. I can understand such a promised given to eminent saints who live near to God, but my soul would prostrate herself before the throne in reverent loving wonder when she hears this word spoken to the very least and meanest of the saints, "Ye shall live." Thou art not exempted, thou whose faith is but as a smoking flax, thou shalt live. The Lord bestows security upon the least of his people as well as upon the greatest. It is plain that the reason given for the preservation of the new life is as applicable to one saint as another. If it had been said, "Because your faith is strong, ye shall live" then weak faith would have perished; but when it is written, "Because I live," the argument is as powerful in the one case as in the other. Take it home to thyself, my brother, however heavy thy heart, or dim thy bone, Jesus lives, and you shall live. Remark yet again that this text is exceeding broad. Mark its breadth and see how it meets everything to the contrary, and overturns all the hopes of the adversary. "Ye shall live." Then the inbred corruption which rides within us shall not stifle the new creature. Chained as the spirit seem to be to the loathsome and corrupt body of this death, it shall live in spite of its hideous companionship. Though besetting sins may be as arrows, and fleshly lusts like drawn swords, yet grace shall not be slain. Neither the fever of hasty passion, nor the palsy of timorousness, nor the leprosy of covetousness, nor any other disease of sin, shall so break forth in the old nature as to destroy the new. Nor shall outward circumstances overthrow the inner life. "For he shall give his angels charge over thee, to keep thee in all thy ways." They shall bear thee up in their hands, lest thou dash thy foot against a stone. If providence should cast you into a godless family, where you dwell as in a sepulcher, and the air you breathe is laden with the miasma of death, yet shall you live. Evil example shall not poison your spirit, you shall drink this deadly thing and it shall not hurt you, you shall be kept from giving way to evil. You shall not be decoyed by fair temptation, you shall not be cowed by fierce persecution: mightier is he that is in you than he which is in the world. Satan will attack you, and his weapons are deadly, but you shall foil him at all points. To you is it given to tread upon the lion and adder, the young lion and the dragon shall you trample under foot. If God should allow you for awhile to be sorely tried, as he did his servant Job, and if the devil should have all the world to help him in his attempt to destroy your spiritual life, yet even on the dunghill of poverty, and in the wretchedness of sickness, your spirit shall still maintain its holy life, and you shall prove it so by blessing and magnifying God, notwithstanding all. We little dream what may be reserved for us; we may have to climb steeps of prosperity, slippery and dangerous, but we shall live; we may be called to sink into the dark waters of adversity, all God's waves and billows may go over us, but we shall live. WE may traverse persilent swamps of error, or burning dewerts of unbelief, but the divine life shall live amid the domains of death. Let the future be bright or black, we need not wish to turn the page; that which we prize best, namely, our spiritual life, is hid with Christ in God, beyond the reach of harm, and we shall live. If old age shall be our portion, and our crown shall be delayed till we have fought a long and weary battle, yet nevertheless we shall live; or if sudden death should cut short the time of our trial here, yet we shall have lived in the fullness of that word. The reason assigned is this, "Because I live, ye shall live also." Christ has life essentially as God. Christ, as man, having fulfilled his life-work, having offered full atonement for human sin, dieth no more, death hath no more dominion over him. His life is communicated to us, and becomes the guarantee to us that we shall live also. Observe, first, that this is the sole reason of the believer's spiritual life. "Because I live, ye shall live also." The means by which the soul is pardoned is found in the precious blood of Jesus; the cause of its obtaining spiritual life at first is found in Christ's finished work; and the only reason why the Christian continues still to live after he is quickened, lies in Jesus Christ, who liveth and was dead and is alive for evermore. When I first come to Christ, I know I must find all in him, for I feel I have nothing of my own; but all my life long I am to acknowledge the same absolute dependence; I am still to look for everything to him. " I am the vine, ye are the branches: he that abideth in me, and I in him, the same bringeth forth much fruit: for without me, yet can do nothing." the temptation is after we have looked to Jesus and found life there, to fancy that in future time we are to sustain ourselves in spiritual existence by some means within ourselves, or by supplies extra and apart from Christ. But it must not be so; all for the future as well as all for the past is wrapped up in the person and the work of the Lord Jesus. Because he died, ye are pardoned; because he lives, ye live; all your life still lies in him who is the way, the truth, and the life. Does not the Christian's life depend upon his prayerfulness? Could he be a Christian if he ceased to pray? We reply, the Christian's spiritual health depends upon his prayerfulness, but that prayerfulness depends on something else. The reason why the hands of the clock move may be found first in a certain wheel which operates upon them, but if you go to the primary cause of all, you reach the main-spring, or the weight, which is the source of all the motion. Many secondary causes tend to sustain spiritual life; but the primary cause, the first and foremost, is because Jesus Christ lives. "All my fresh springs are in thee." While Jesus lives, he sends the Spirit; the Spirit being sent, we pray; our prayer becomes the evidence of our spiritual life. "But are not good works essential to the maintenance of the spiritual life?" Certainly, if there be no good works, we have no evidence of spiritual life. In its season the tree must bring forth its fruit and its leaves; if there be no outward sign we suspect that there is no motion of the sap within. Still, to the tree the fruit is not the cause of life, but the result of it, and to the life of the Christian, good works bear the same relationship, they are its outgrowth, not its root. If then my spiritual life is low, what am I to look to? I am not to look to my prayers, I am not to find comfort in my works. I may from these discover how declining I am; but if I want my life to be renovated, I must fly to the fountain of my life, even Jesus, for there, and there only, shall I find restoration. Do let us recollect this, that we are not saved because of anything that we are, or anything that we do; and that we do not remain saved because of anything we are or can be. A man is saved because Christ died for him he continues saved because Christ lives for him. The sole reason why the spiritual life abides is because Jesus lives. This is to get upon a rock, above the fogs which cover all things down below. If my life rests on something within me, then to-day I live, and to-morrow I die; but if my spiritual life rests in Christ, then in my darkest frames-ay, and when sin has most raged against my spirit- still I live in the ever-living One, whose life never changes. Secondly, it is a sufficient cause for my life. "Because I live, ye shall live also." It must be enough to make believers live that Christ lives; for first, Christ's life is a proof that his work has accomplished the absolution of his people from their sins. He would have been in the tomb to this hour had he not made a complete satisfaction for their sins, but his rising again from the dead is the testimony of God that he has accepted the atonement of his dear Son; his resurrection is our full acquittal. Then if the living Christ be our acquittal, how can God condemn us to die for sins which he has by the fact of Christ's resurrection declared to be for ever blotted out? If Jesus lives, how can we die? Shall there be two deaths for one sin, the death of Christ and the death of those for whom he died? God forbid that there should be any such injustice with the Most High. The very fact that Jesus lives, proves that our sin has been atoned for, that we are absolved, and therefore cannot die. Moreover, he is the surety for his people, under bonds and pledges to bring his redeemed safely home. His own declaration is, "I give unto my sheep eternal life, and they shall never perish, neither shall any pluck them out of my hands." Will he break his covenant bonds? Shall his suretyship be cast to the winds? It cannot be. The fact that if any of his people for whom he died, to whom he has given spiritual life, should after all die, Christ would be disappointed of his intent, which supposition involves the grossest blasphemy. What so many shall he have for his reward? The purchase-price shall not be given in vain; a redemption so marvelous as that which he has presented upon the tree, shall never in any degree become a failure. His life, which proves his labour to be over, guarantees to people. Know ye not, my brethren, that if one of those to whom Christ has given spiritual life should after all fall from it and die, it would argue either that he had a want of power to keep them, or a want of will to do so. Shall we conceive him to be devoid of power? Then how he is mighty God? Is he devoid of will to keep his people- is that conceivable? Cast out the traitorous thought! He must be as willing as he is able, and as able as he is willing. While he was in this world, he kept his people; having loved his own, he loved them to the end; he is "the same yesterday, to-day, and for ever," he will not suffer one of these little ones to perish. Recollect, and this perhaps will cheer you most of all, that all who have spiritual life are one with Christ Jesus. Jesus is the head of the mystical body, they are the members. Suppose one of the members of the mystical body of Christ should die, then from that moment, with reverence be it spoken, Christ is not a complete Christ. What were the head without the body? A most ghastly sight. What were the head with only a part of the members? Certainly not perfect. There must be every member present to make a complete body. Therefore we gather that you, brother, though you think yourself the meanest part of the body, are nevertheless, essential to its perfection; and you, sister, though you fancy yourself to be one of the uncomely portions of the body, yet you must be there, or else the body cannot be perfect, and Christ cannot be a complete Christ. From him, the head, the life streams into all the members and while that head lives as a perfect head of a perfect body, all members must live also. As we have often said, as long as a man's head is above water you cannot drown his limbs; as long as our head is above the reach of spiritual death we also are the same-no weapons can hurt, no poison can destroy, not all hell's fires could burn, nor all earth's floods could drown, the spiritual life within us: it must be safe because it is indissolubly one with Jesus Christ the Lord. What comfort, then, lies in this, the sole but sufficient reason for the eternal maintenance of the new-born life within us, is this, "Because I live, ye shall live also." And be it remembered, that this reason is an abiding reason—"Because I live, ye shall live also"—a reason which has as much force at one time as another. From causes variable the effects are variable; but remaining causes produce permanent effects. Now Jesus always lives. Yesterday, dear brother you were exalted in fellowship with him, and stood upon the mountain top; then your heart was glad, and your spirit rejoiced, and you could say, "I live in Christ." To-day darkness has intervened, you do not feel the motions of the inner life as you did yesterday, but do not therefore conclude that the life is not there. What is to be your sign; what is to be the rainbow of the covenant to you? Why, that Jesus lives. Do you doubt that he lives? You dare not. You trust him, doubt not then that you live, for your life is as sure as his. Believe also that you shall live, for that also is as sure as the fact that he lives. God gave to Noah, a token that he would not destroy the earth-it was the rainbow: but then the rainbow is not often seen; there are peculiar circumstances before the bow is placed in the cloud. You, brother, you have a token of God's covenant given you in the text which can always be seen, neither sun nor shower are needful to its appearance. The living Christ is the token that you live too. God gave to David the token of the sun and the moon; he said if the ordinances of day and night should be changed, then would he cast off the seed of David. But there are times when neither sun nor moon appear, but your token is plain when these are hidden. Christ at all times lives. When you are lowest, when you cannot pray, when you can hardly groan, when you do not seem to have spiritual life enough even to heave a desire, still if you cling to Jesus this life is as surely in you as there is life in Christ himself at the right hand of the Father. And lastly, it is a most instructive cause. It instructs us in many ways: let us hint at three. It instructs us to admire the condescension of Christ. Look at the two pronouns, "ye" and "I"; shall they ever come into contact? yes, here they stand in close connection with each other. "I"—the I AM the Infinite; "ye" the creatures of an hour; yet I, the Infinite, come into union with you, the finite; I the Eternal, take up you the fleeting, and I make you live because I live. What? Is there such a bond between me and Christ? Is there such a link between his life and mine? Blessed be his name! Adored be his infinite condescension! It demands of us next abundance of gratitude. Apart from Christ we are dead in trespasses and sins; look at the depth of our degradation! But in Christ we live, live with his own life. Look at the height of our exaltation, and let our thankfulness be proportioned to this infinity of mercy. Measure if you can from the lowest hell to the highest heaven, and so great let your thankfulness be to him who has lifted you from death to life. Let the last lesson be see the all-importance of close communion with Jesus. Union with Christ makes you live; keep up your enjoyment of that union, that you may clearly perceive and enjoy your life. Begin this year with the prayer, "Nearer to thee, my Lord, nearer to thee." Think much of the spiritual life and less of this poor carnal life, which will be soon be over. Go to the source of life for an increase of spiritual life. Go to Jesus. Think of him more than you have done, pray to him more; use his name more believingly in your supplications. Serve him better, and seek to grow up into his likeness in all things. Make an advance this year. Life is a growing thing. Your life only grows by getting nearer to Christ; therefore, get under the beams of the Sun of the Righteousness. Time brings you nearer to him, you will soon be where he is in heaven; let grace bring you nearer also. You taste more of his love as fresh mercies come, give him more of your love, more of your fellowship. Abide in him, and may his word abide in you henceforth and for ever, and all shall be to his glory. Amen.